Great for Families, Pool Table, Hot Tub, Pet Friendly, Walk to Lake w/View! The Chipmunk Lodge offers lots of sleeping options, entertainment features, and room to move around! It's the perfect place whether you are a group of friends or a few families looking to stay together, this place is sure to please! Conveniently located to enjoy all the popular attractions and activities. 5 Bedroom/3 Bath - Walk to the Lake with View! *An additional "twin" roll-a-way is available and can be set up in the den. The Ultimate in Hot Tub Luxury! The main floor is open with a front deck and back deck leading to and from the room. One side of the living room is completely adorned with used brick which includes a wonderful fireplace. The opposite side of the room showcases an incredible log staircase. The floor space in between the two offers a comfortable sectional with accent chairs perfectly placed to form an intimate social area focused on the viewing pleasures of the outdoors as well as a warmly lit hearth. Access the back deck from this room and enjoy sitting out in the fresh mountain air. The kitchen and dining area also include logs and accents of knotty pine and log. The kitchen is complete with all appliances, cookware, dishes, and utensils. Perfectly appointed to save money by having meals in. The front deck offers a barbecue and dining table and seating for those who enjoy cooking and eating outdoors. Furniture on both front and back decks are a plus. There's a massive log staircase leading guests to a private bedroom on the uppermost level offering a king bed as well as twin, a nice view of the lake, and TV. An additional log staircase leads guests to the downstairs bottom level which is the gateway to the den, home to more entertainment features along with a wood burning fireplace, pool table, and TV with VCR and DVD. There are two master bedrooms on the bottom level. One bedroom has a TV and bathroom within and the other is in close proximity to a full bath with privacy once the door to a small hallway is closed. A washer and dryer is also a convenient offering as it is the perfect amenity to dry young childrens clothes in the winter after an afternoon of snow play or packing lighter when choosing to stay longer than a weekend. We wanted to give our young children an opportunity to experience the seasonal changes throughout the year. Our work schedules did not allow much time for travel experiences, we needed to keep to something that wouldn't require more than a couple of hours drive as we were looking to spend more of our time relaxing rather than traveling to the destination. Also important was a destination that we could enjoy and expose our children to a variety of activities including seasonal changes, especially snow. Big Bear won our hearts, it's the perfect place whether you are looking for activities to do or just relax and enjoy. An awesome Lake and awesome Slopes, there aren't many areas that offer such diversity and beauty in Southern California. We are so fortunate to have our home in Big Bear and are happy to allow other families to share, experience, and make your own special memories as we have! We know you will love it as much as we do! Before seeing the property we say the name of the street, Chipmunk. It struck us so that we hoped we would find the perfect cabin on the street. As luck would have it we found this wonderful cabin. It's exterior charm and the lay of the land really heightened our interest. One of the nice attributes is that the properties that are technically across the street are situated such that you really don't see them from the kitchen window because across the street properties are located on top of the hill, which makes it nice and lends itself to more of the feeling of nature. This cabin had all the space we wanted, 5 bedrooms and 3 bathrooms. A bonus was that it also had a seperate den in addition to the livingroom. And, we love to burn a fire in the fireplace, this property has two! We also loved that we can see the lake from many of the rooms in the home as it is only 1 street up from the lake. The yard has many options, the front yard is a nice place for the kids to play in the snow and the south side of the home had the perfect place for us to put in a custome hot tub. Its larger capacity is sized to fit the spot just right. The north side of the property is the most awesome place in the winter as it turns into its own 'snow play' hill. No need to pay for such fun at the commercial resorts, save your money, the kids will have fun all day, our kids look forward to it every year! The neighborhood terrain is perfect to allow young children to ride their bicycles and is great for taking morning or evening walks, easy enough for seniors to enjoy as well. We were told that the area of Boulder Bay tends to get more snowfall than other areas of Big Bear. For us, you didn't need to tell us twice, we definitely wanted to make sure our home would have snow when the potential was there. We are very happy we did! 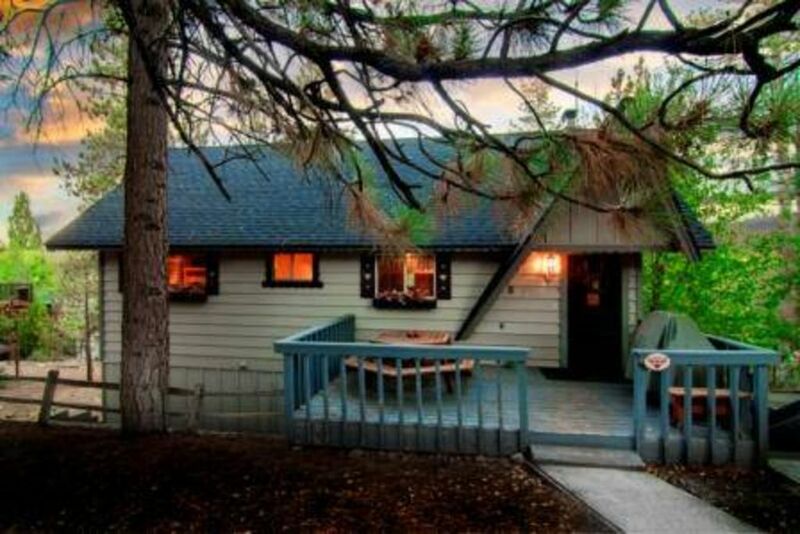 It's quiet location is also wonderful since it is far enough from the main boulevard that takes you to all the fun activities in Big Bear yet close enough to get you where you want to go with convenience. It's close proximity (1 street up) to Pleasure Point Marina makes launching our boat or renting any number of boats and water craft extremely convenient. The marina also offers fishing licenses, charter fishing excursions and a functional cable park. It's also walking distance to the newest Big Bear waterfront park, Boulder Bay Park, great for shore fishing, launching your canoe or kayak or just enjoying the beauty that surrounds. Getting to the slopes of Big Bear takes only minutes whether you are skiing the slopes of Snow Summit or boarding the slopes of Bear Mountain. The place is beautiful and cozy, me and my family have a great time. The rooms are clean and spacious, they have a full kitchen, and the Jacuzzi was fun. We definitely came back again. The house was cozy and had a great cabin feel. The kids loved the sledding slope on the side too. Would have been a 5 star accommodation if the bathroom sink wasn't clogged and the roof didn't leak in one of the bedrooms. I spent a LOT of money to come for two evenings to bring my staff for our annual trip and there was one problem after another. My bedding had blood and "other" stains all over which I found as soon as I jumped into bed. I was forced to go sleep on a sofa. Don't expect to play pool on the pool table. It's all lopsided and more of just a kids toy. 4 of my staff were unable to use their bathroom because of an awful sewage smell and when we called to tell the management we were told "what do you want us to do? You can still use the bathroom right? Just because it smell bad you want us to come over? I guess I can bring you some febreeze." So she essentially made us feel like we were difficult because my staff could literally not even stand the smell enough to sit in the bathroom for 2 minutes! Only 1 street up from the lake, a brief walk block walk down will put you right at Pleasure Point Marina. Pleasure Point Marina offers professional fishing charters, boat rentals, a variety of water craft rentals such as canoes, kayaks, childrens boats with water guns etc., dock rentals are also available. Also is home to the cable park on the lake. Stock up on your fishing gear of purchase your fishing license. Boulder Bay Park, the newest waterfront park in Big Bear. Only a brief walk (my 81 year old mother walks it) gets you to the shoreline for fishing or a picnic on the water. Big Bear Marina is approximately 1 1/2 miles away from the cabin. The Marina offers lake tours and rents out kayaks, jet skis, boats, etc. There is public Lake access is available right next to this marina. Pine Knot Marina, just at the entrance of the Village which is approximately 2 miles from the cabin. Home to a paddle boat tour (The Miss Liberty), para-sailing, jet skis and boat rentals. The Bowling Barn is a favorite hot spot and is just under 2 miles from the cabin. Other features offered here are Large Screen Sports TV, Pool Tables, Arcade Games and Bowling for all ages. Glow Bowling begins at 8:30p (M-F) and 7:30p (S-S). The Village is approximately 2 miles from the cabin. Filled with souvenier shops, restuarants, arcades, ice-cream & candy stores, there's something for everyone to explore. The Village also has a cinema that offers first run movies everyday with a total of 5 screens. Magic Mountain fun area is home to the only Alpine Slide in Southern California. This is approximately 1.5 miles distance from the cabin. Summer or winter you can luge down the slide in bobsleds after riding the chair lift to the top of the mountain. It's thrilling indeed. Dual Water Slides at Magic Mountain as well as minature golf, slick track race track, and a video game room and snack bar. Meadow Park - Approximately a 12 minute drive from the cabin. Lots of things to do here. The most noted is the only swim beach in Big Bear! There are also tennis courts, and a volleyball sand court. The Summit Sky Chair is located at the Snow Summit Ski area. The distance is approximately a 7 min drive from the cabin. Riders enjoy the experience of ascending from 7000 base to 8200 feet. At the top, there are many trails set up for mountain biking or hiking trails. There's also a snack chalet at the top as well as incredible over view of the lake. The Discovery Center, run by the Forest Service, provides hiking permits and offers, for a low cost, kayaking and canoe tours, and craft classes for kids; for free, forest classes. It is located across the lake on north shore. Moonridge Animal Park about a 15 min drive, the Zoo is located across the street from Bear Mountain. Baldwin Stables about a 30 min drive from the cabin.